GAZA CITY (CNN) -- Israel bombed a Hamas government compound early Tuesday, leveling at least three structures, including the foreign ministry building, eyewitnesses and Hamas security sources told CNN. 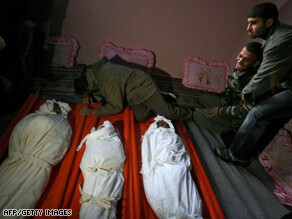 Relatives mourn three boys from the same family who were killed in an Israeli airstrike Monday in Gaza. A Gaza-based journalist, whose name was withheld for security reasons, told CNN he heard 18 blasts in the area and that two fires were burning at the compound early Tuesday. More bombs continued to drop over Gaza through the morning. With Tuesday's bombs, Israel appeared to extend its airstrike campaign in Gaza to a fourth day. The strikes -- which Israel says are aimed at stopping the firing of rockets from Gaza into southern Israel -- have killed more than 375 Palestinians, most of them Hamas militants, Palestinian medical sources said Tuesday. At least 60 civilians have been killed in Gaza, U.N. officials said. About 650 people have been wounded there, according to the Palestinian medical sources. Monday, Israel's defense minister said the nation was in an "all-out war" with Hamas, the Palestinian militant group that rules Gaza. "We have stretched our hand in peace many times to the Palestinian people. We have nothing against the people of Gaza," Defense Minister Ehud Barak told Israel's parliament. "But this is an all-out war against Hamas and its branches." Israel continues to strike Hamas targets in Gaza, an Israel Defense Forces spokesman told CNN. Mortar fire along the Gaza border late Monday killed one Israeli soldier and wounded four others, he said. Iyad Nasr, a spokesman for the International Committee of the Red Cross, said the streets of Gaza were largely empty during airstrikes Monday morning. Six Israelis have died over the past three days, five of them civilians. One of the rocket strikes killed an Israeli at a construction site in Ashkelon, 6 miles (10 kilometers) north of Gaza, and wounded eight others, a hospital spokeswoman said. Rocket strikes killed an Israeli and wounded two others at Kibbutz Nahal Oz, according to Israeli police and hospital spokespersons. Rocket attacks also wounded two people, one seriously, in Ashdod. One woman who was critically injured during the attack died later during an operation, according to Israeli medical sources. Israel has struck more than 300 Hamas targets since Saturday, its military said. The Israeli air force carried out at least 20 airstrikes on Gaza on Monday, Israeli military sources said. Hamas security sources said the targets included the homes of two commanders of Hamas' military wing, the Izzedine al-Qassam Brigades, in the Jabalya refugee camp just north of Gaza City. Neither commander was among the seven people killed in those strikes, the sources said. The Israeli military had no immediate comment on a report by Dr. Mu'awiya Hassanein that a strike near a mosque in Jabalya killed five children in a nearby home. The situation triggered protests in Iran, Greece, Britain and Lebanon, and the Iranian government declared a day of mourning for Palestinians in Gaza. "All true believers in the world of Islam and Palestinian fighters are duty-bound to defend the defenseless women and children in Gaza Strip and those giving their lives in carrying out such a divine duty are 'martyrs,' " Khamenei said through Iran's official news agency IRNA. U.S. and Israeli officials told CNN that Hamas militants in Gaza have received support from Iran in the past in the form of weapons, training and cash. "We know of Hamas operatives, commandos and soldiers who were trained in Iran itself. We know that. So there is a close cooperation and exchange of know-how and activities," said Isaac Herzog, a member of the Israeli Security Cabinet. Iran denies any involvement with Hamas. But an Iranian official told CNN Iran has ties to Shiite groups such as Hezbollah, a political party in Lebanon with alleged terrorist roots. U.N. Secretary-General Ban Ki-moon condemned Hamas for the rocket attacks, but also had strong words for Israel. "While recognizing Israel's right to defend itself, I have also condemned the excessive use of force by Israel in Gaza. The suffering caused to civilian populations as a result of the large-scale violence and destruction that have taken place over the past few days has saddened me profoundly," he said in a prepared statement. The U.N. Security Council called for both sides to immediately end the violence, but Israeli Prime Minister Ehud Olmert said Sunday that the campaign could last "for some time," and his Cabinet voted to call up 7,000 reservists. Hamas pledges it will defend its land and people from what it calls continued Israeli aggression. Each side blames the other for violating an Egyptian-brokered cease-fire. The truce formally expired December 19, but it had been weakening for months. Both Barak and Israeli Foreign Minister Tzipi Livni will be vying in February for the prime minister's post against Likud Party leader Benjamin Netanyahu. Both Barak and Netanyahu have previously held the post. The ongoing assault and threat of Israeli military ground incursion caused panic in Gaza City, the territory's densely populated capital, a U.N. humanitarian official told CNN on Monday. "It's very bad, people are running in all directions because of the bombings that are happening everywhere," Karen AbuZayd said from Gaza City. AbuZayd is the commissioner-general of the U.N. Relief and Works Agency, which provides assistance to about 80 percent of Gaza's 1.5 million residents. Israel allowed more than 50 trucks carrying relief aid into Gaza on Monday -- in addition to 40 on Sunday -- Israeli military sources said. The U.N. is expecting 100 trucks Monday, but a U.N. official said it will not be enough to alleviate the worsening humanitarian situation. In the West Bank, Saeb Erakat, adviser to Palestinian Authority President Mahmoud Abbas, urged Israeli and Hamas leaders to put another cease-fire in place. CNN's Paula Hancocks and Shira Medding contributed to this report.